New signs at Fenway Park inform fans of the policy change. A controversial piece, or more appropriately, wad, of baseball tradition will be forbidden from Fenway Park this year — the brown, sludge-like smokeless tobacco players have stuffed in their cheeks for decades and spit on the ground. 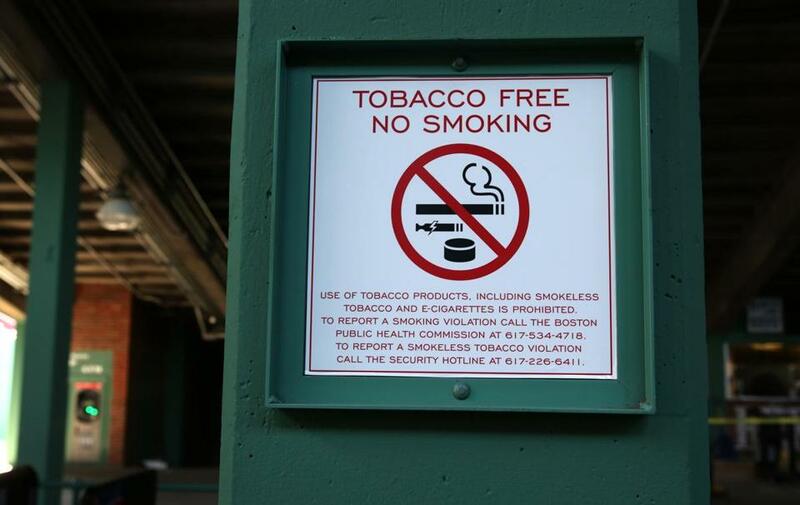 Instead, bright red “Tobacco Free” signs and flashing video billboard messages are expected to greet fans at the Red Sox home opener Monday, reminding all that tobacco products, including smokeless chew and electronic cigarettes, are prohibited. Boston became the second US city, behind San Francisco, to ban smokeless products at ballparks. San Francisco’s prohibition started in January, and Boston’s law, adopted last fall, took effect Friday. The campaign to rid the sport of a product rife with serious health consequences is aimed at influencing youngsters who idolize tobacco-chewing ballplayers. But the players union has refused in its contract to accept such prohibitions, which New York, Chicago, and Los Angeles have also recently adopted. That raises the possibility that some defiant players may still dip, chew, and spit while playing before young fans in ballparks where it is banned. In Boston, the rules cover the city’s baseball parks and other professional and amateur sports venues. Event organizers are responsible for overseeing compliance, and violators can be fined $250 for each offense. If scofflaws turn truculent after being warned, Boston police will intervene. McCarthy notes the regulation gives police wiggle room over whether to issue citations — the language used is “may” instead of “shall.” An officer would have to witness the infraction, and decide whether the offense was willful. Most likely, McCarthy said, officers will issue warnings. The Red Sox, in a statement, said players have been told about the new law. The statement was less clear about whether the team will punish players who break the rule. Smokeless tobacco has been linked to oral and digestive cancers and to gum ailments. While the battle to ease tobacco’s grip on the nation has recorded significant victories — notably a declining number of Americans who smoke — the desire for chew and other smokeless tobacco products has grown among teenagers and young adults. High school athletes are using smokeless tobacco products at nearly twice the rate of students who don’t play sports, according to a recent report from the US Centers for Disease Control and Prevention. And smokeless tobacco use among adolescent athletes increased more than 11 percent from 2001 to 2013, the most recent data available, even as smoking rates declined significantly. “A big reason for this is the impact on adolescent boys of seeing their sports heroes use this product day in and day out on national television,” said Matthew Myers, president of the Campaign for Tobacco-Free Kids. Myers’ organization was one of 34 groups, including the American Medical Association and the American Academy of Pediatrics, to sign a letter to Major League Baseball and its players last week urging both sides to “set the right example for kids” and end smokeless tobacco use at all major league ballparks. The health groups lobbied unsuccessfully in 2011 to rid baseball of smokeless tobacco as the league negotiated a labor agreement with the players. That agreement included some limits, but the union opted not to ban tobacco entirely. Players can’t carry tobacco packages in their uniform pockets, and tobacco use during televised interviews is prohibited. Advocates of a ban then devised a new strategy, bringing their fight to each major league city, with San Francisco the first stop. “Plenty” of players still rely on chew, according to Red Sox slugger David Ortiz, who quit using after the 2014 death of Hall of Famer Tony Gwynn from salivary gland cancer. Gwynn blamed the cancer on dipping smokeless tobacco during his 20-year career with the San Diego Padres. Red Sox pitcher Steven Wright agreed. The statement said tobacco cessation products will be provided free of charge in both the Red Sox and visitors’ clubhouse. Still, the Major League Baseball Players Association is not a fan of the new rules. Bouris said the association has asked ball clubs in cities with smokeless tobacco bans to provide players with alternatives — gum, sunflower seeds, and products made out of coffee grinds and other herbs. In California, a statewide ban on smokeless tobacco in ballparks is slated to go into effect next season. Once that is implemented, one-third of major league stadiums will be tobacco-free, and other cities are considering similar measures, according to the health groups lobbying for the bans. Neither Major League Baseball nor its players association has issued information about how many major leaguers use smokeless tobacco, but Myers, of the Campaign for Tobacco-Free Kids, said health advocates peg use as high as 30 percent. Nick Cafardo of the Globe staff contributed to this report. Kay Lazar can be reached at Kay.Lazar@globe.com. Follow her on Twitter @GlobeKayLazar.